When people talk about living a healthier lifestyle or wanting to start on a weight loss journey, there seems to be one particular item that is always mentioned: drink more water! I’ve said it myself many times. I know I don’t drink enough water. I have good intentions, but my execution isn’t the best. I always forget and I never know how much I’m drinking. It’s not easy to keep track especially when you are busy. It’s a fact – we need water to live. A person will die within three days without water. Also, even if you are drinking water, do you know if you are drinking enough? Without enough water, you can get dehydrated which causes a whole slew of issues like electrolyte imbalances, bowel concerns, fatigue and cloudy thinking. The saying water is life is very true. When you watch Survivor or any reality show where they are in the wilderness, priority #1 is always to find a source of fresh water. Water not only keeps you alive, but also has many other important benefits. When you drink the appropriate amount of water per day you’ll look and feel better mentally and physically. Your skin and hair will look better and you can think more clearly. It detoxifies the body and keeps urine diluted – this decreases the risk of kidney stones which are no fun to have! Another important thing I wanted to mention is that we often mistake thirst for hunger. I think this is my issue. I need to make drinking water a priority and lose the extra weight. I recently learned about a product that is one of the coolest things I’ve seen in awhile. 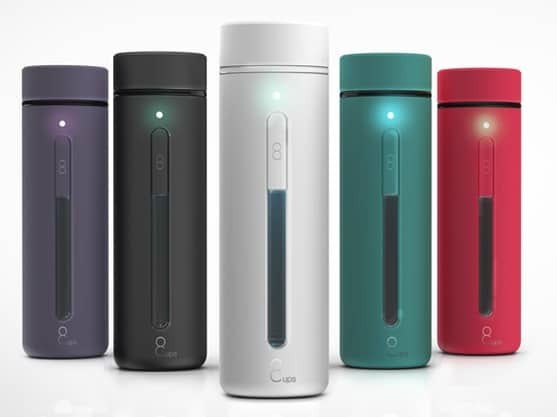 8Cups is a smart water bottle that syncs with your smartphone app to track your water intake and reminds you to drink more. It reminds me a little of those fitness trackers you wear on your wrist to track activity. 8Cups does the same with water to make sure you are drinking the recommended amount per day. It’s pretty genius! 8Cups was developed by Jellycoaster.com. The CEO, Daniel Joo, realized how important drinking an adequate amount of water each day was after developing a kidney stone. His doctor advised him to drink more water as part of his treatment. Daniel discovered how difficult it was to keep track of how much water he was drinking each day and was often forgetting to do it. After his wife became pregnant and she was advised by her doctor to drink 8 glasses of water each day, Daniel came up with the concept of 8Cups – a system designed to ensure you drink enough water each day. Wireless Charging: 8Cups uses a wireless charging system and each charge lasts up to one week of use. Waterproof: You can wash the bottle without worrying about damaging it. The technology and sensors are sealed within the design. Rubber Bottom: It has a non-slip rubber bottom to keep it secure on wet, smooth or slippery surfaces. Magnetic Top: The top is held on magnetically allowing it to stay securely closed and easy to open with just one hand. Eco-friendly: 8Cups is made of Tritan, a safe, BPA-free type plastic for long-lasting and wear-resistant use. It will reduce waste as it is meant to replace using disposable water bottles. 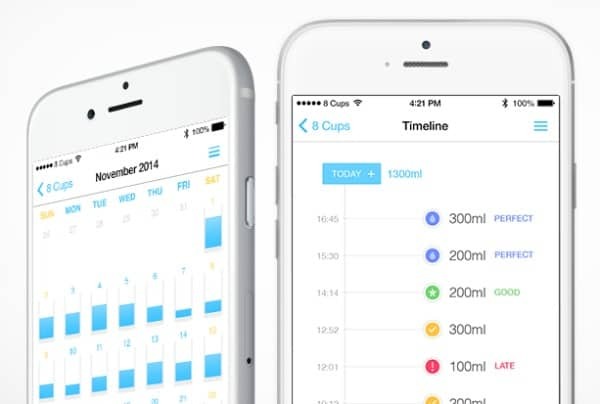 8Cups Smartphone app (Android/iPhone): Includes a calendar with a timeline to chart your water intake, gives you the ability to set goals for water intake, tracks your water intake, notifies you when its time to drink more water and even does photo recording. 8Cups is planning to integrate with smartwatches! Watch for that exciting announcement late next year. 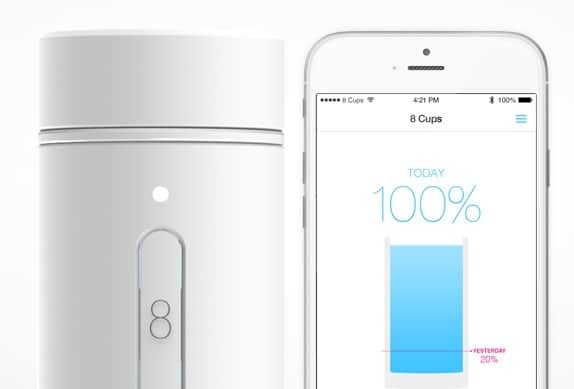 Currently, 8Cups is on Indiegogo and is looking for funding to help them move forward in the production of this innovative product. They’ve got a variety of perks for people who donate. They estimate an April 2015 delivery date for your order. Everything you need will be included in the package. It’s free shipping to South Korea, $20 to the USA and $25 for international orders. I think 8Cups has the potential to help a lot of people. I know I could benefit from drinking more water and 8Cups seems like just the solution I need! Connect with 8Cups on Facebook and Twitter and their website. I really like this. I forget to stay hydrated during the day and this could help. What a great idea! I try to drink my 8 glasses but find it difficult by times. This would be a lifesaver for me. I don’t drink nearly enough water so this 8Cups would be the perfect thing. It has great features such as letting you know you need more water. I should drink more water but find it difficult to remember to do so. This would be a great help. Thanks for sharing! I totally need this! I don’t drink a lot. Of anything. I have a couple cups of tea in the morning. Then a glass of water, maybe two. Total. This is going to be a resolution for me in 2015. Water!!! 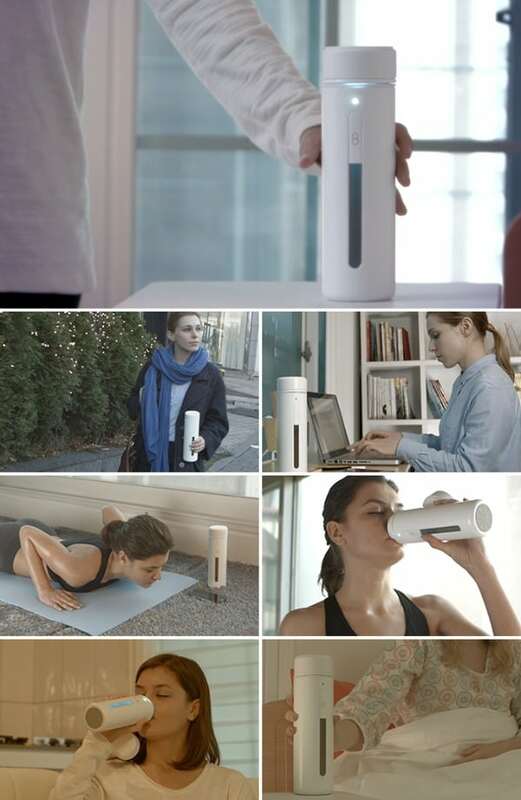 This is so cool, I have no problem drinking 8 cups of water a day, but I would still love to own this! I don’t need a bottle to tell me. I have my water by my side all day. This is nice, I have a smaller lid cup that use to drink water but this would be nice as it holds more water. Wow! What an amazing water bottle. 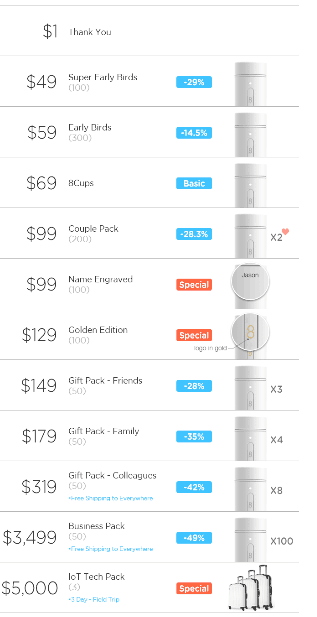 I really want one, I’m adding the 8Cups smart water bottle to my wishlist. Thank you for sharing this review. How helpful and convenient! A great way to help you keep track and calculate your intake. Water is very important, and you’re right number one on most health lists. It’s good for you inside and out. Drink up. I agree with Sarah L, I don’t need a bottle like this to tell me, but it sure looks looks like a fun gadget. And if it motivates me to drink more, I’m game! This is such a great idea – I try to drink as much water as I can during the day! Very interesting idea. Seems high tech, but if it helps people, thats great! OK, I think I might actually get this. This is such a great idea! water, get in my system! This is such a cool app & product! I know I don’t drink enough water and even start to feel dehydrated at times. Maybe my resolution this year will be to start drinking more and keep track of my water intake. This would certainly make it easier. Thank-you for the cool info.! I forget to stay hydrated during the day and this could help.I really like this! Great idea for everyone! I do drink a lot of fluids but not always enough water. When I get my card replaced on my phone, I may try it out at a later time. Thank you for your review and Merry Christmas to you and your loved ones! I try to make sure to drink enough water every day! This is such a great idea to help me keep track of how much water I am drinking and to make sure that I am getting enough. I sure would to get the 8Cups! This would be great for people like me who get caught up with things and forget to drink water. I need to drink more water for health reasons…this is very good advice. This is great. I like that it reminds you when to drink more water. I know I dont. A lot of my friends carry a water bottle around all day so this would make a wonderful Christmas gift for them. Thanks for the info on it. I really need to check this out because I never drink enough water and this bottle reminding me to do it would really help. I am trying to lose weight and this is a great tool to make sure I stay on track with my water intake. I don’t drink nearly the amount of water I should. The problem is I am very fussy about the taste of water. I do not like the water from our faucet and am brand loyal when it comes to bottled waters. Another issue, hubby is morally against the concept of buying water. So there’s lots of roadblocks. I have a 8Cups bottle and it’s already broken after using it for a couple weeks! Don’t expect any support from the 8Cups team. – The shipment to the Netherlands took a month and I had to pay an extra €26 for the shipment which I never got back from 8Cups. – You will get no wall charger, just a USB cable. – The accuracy of the bottle is not good, but this could be fixed with a new version of the app. – I used my bottle for a couple weeks and now it’s already broken. The battery only lasts a couple hours instead of 3 days. – There is no way to to fix a broken 8Cups bottle yourself.